After building an audience over decades as the anchor of AZPM’s Arizona Illustrated, local legend Bill Buckmaster wasn’t ready to retire. So he found a new home doing independent radio Monday through Friday. Buckmaster, who has to be the most knowledgeable, fair and balanced host in town, continues to host a wide range of newsmakers, authors, artists, journalists, economists and other guests who have something interesting to say. Buckmaster demonstrates with every show how much this town needs a radio host who understands the context of what this town is all about. The three Democrats running for Tucson City Council in north-central Ward 3 clashed Wednesday on two proposals to raise the city’s sales tax. The proposals are Strong Start’s push for a half-cent increase in revenues dedicated to schools, and another plan for a one-tenth of a cent increase going to Reid Park Zoo. Candidates Tom Tronsdal, Paul Durham and Felicia Chew are competing in next month’s primary election for the Democratic nomination to succeed outgoing Councilwoman Karin Uhlich. Local firefighter Gary Watson is running in Ward 3 as an independent. There are no Republican candidates for the seat. During a live interview Wednesday on radio, host Bill Buckmaster’s KVOI program, only Chew, among the Democrats, signaled her support for the sales-tax proposals. Watson was not part of the interview. Bill Buckmaster begins 6th year of radio show and 50th year in the business! After being inducted into not just one, but two, different Hall of Fames for Broadcasters in Arizona and Nevada, Bill Buckmaster is still going strong as he prepares for this 6th-anniversary show today at noon on KVOI-1030AM. Buckmaster is also celebrating his 50th year in the business this year. Two down. Only 48 more to go. Just last year Bill Buckmaster was recognized by the Arizona Broadcasters Hall of Fame for his decades of familiar work as the lynchpin of Arizona Illustrated, the then nightly news program that aired on Tucson PBS affiliate KUAT TV. A year later, it has happened again. This time, the Nevada Broadcasters Hall of Fame has honored Buckmaster, based on radio work he did in Las Vegas before he accepted the Arizona Illustrated position in the mid-80s. Radio host and longtime Tucson television personality Bill Buckmaster will be inducted into the Nevada Broadcasters Association Hall of Fame in August. Buckmaster, who hosts a daily radio program on KVOI-AM radio in Tucson, was a radio journalist in Nevada in the 1970s. He also hosted “Arizona Illustrated” on KUAT-TV for more than two decades in Tucson, and was inducted into the Arizona Broadcasters Hall of Fame in 2015 by the Arizona Broadcasters Association. Buckmaster estimates he has interviewed more than 5,000 people. This pick couldn’t have happened to a nicer guy. Buckmaster is a news legend in this town, and it comes with a reputation—we are talking super strength reputation—for being fair and nice to everyone who walks into his studio. He makes other local media folks part of his daily radio show, and welcomes them with support and interest in their work and life. It’s so appreciated, Bill. We love you. You know you’ve made it if one name suffices. Getting inducted into a Hall of Fame is pretty good indication as well. For folks in radio and television, and those who have watched and listened to his broadcasts for the better part of 30 years, just say Buckmaster and they know you’re talking about Tucson’s foremost objective interviewer. It was three years ago this week that Bill Buckmaster started discussing a rather radical change. Buckmaster sat down with longtime local radio talk-show fixture John C. Scott to talk about taking a big chance. It involved abandoning the program through which he had become a known commodity, the program he had helped to launch a quarter-century earlier. He was ready to leave Arizona Illustrated on PBS affiliate KUAT Channel 6 and give the brokered radio talk-show venture a go. If you haven’t caught his show yet, it’s a must listen for anyone that gives a darn about what goes on in our town. It’s on KVOI 1030 AM weekdays from noon to 1 pm. 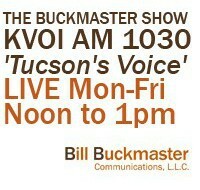 Bill Buckmaster, host of the Buckmaster Show on KVOI AM 1030 radio, announced that he will not take any political advertising on his show as the campaign season heats up in Tucson. Buckmaster, who was host of KUAT’s “Arizona Illustrated” for 23 years, returned to his roots in radio in January at KJLL in Tucson. He moved to KVOI in June, where he hosts an hourlong interview-based show at noon. The show reaches eight counties in Arizona, and into New Mexico. Buckmaster said he made the decision after he was approached by candidates for Tucson’s Nov. 8 general election. He said he will continue to interview candidates from all parties but won’t air political commercials. 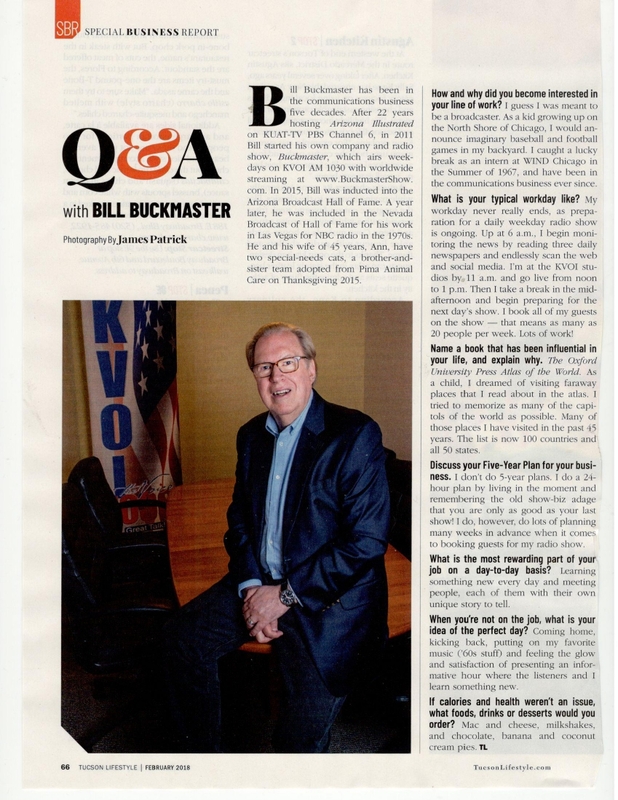 Bill Buckmaster endured a turbulent first 10 months and change on the radio. He left hosting duties on the “Arizona Illustrated” TV show after 23 years to start a talk-radio show on KJLL 1330-AM. After only three months, Buckmaster bolted to KVOI 1030-AM, where he’s since settled in. His show airs from noon to 1 on weekdays. After four months on the air, Bill Buckmaster is moving his hour-long weekday radio show to a new home. Starting June 1, the radio show will air at noon on the Voice KVOI 1030-AM in Tucson, and on KAPR 930-AM in Douglas and KJAA 1240-AM in Globe. He’ll finish out the next two weeks on the Jolt KJLL 1330-AM, where the show has been airing live at 9 a.m. weekdays since Jan. 3. During May, Buckmaster says he’s going to work with advertising clients and line up additional guests and regular contributors for the new show. Buckmaster had hosted “Arizona Illustrated” on KUAT-TV 6 for nearly 22 years and left that job in November to pursue the radio show. He said he’s been extremely pleased with the response from listeners who appreciate his informative and interview-driven style. “I’m having a ball. You can keep notes at hand and not have to worry so much about looking into the camera plus, you don’t have to wear that high-definition make-up,” Buckmaster said. Another plus is that the noon-time broadcast means his show will air at a time when more people are in their cars and can listen. It’s also easier for guests to stop by. He said that idea came from Doug Martin, president and general manager, of the group that owns KVOI, KAPR and KJAA. Buckmaster said he leaves the Jolt with no ill-feelings. “I’m very grateful for the opportunity John C. Scott has given me and I think he understands the reasons and is supportive of the move,” he said. After decades of stability, broadcast veteran Bill Buckmaster’s career has become as active as a pinball. A little more than three months into his new radio venture, having started the round-table news show “Buckmaster” on KJLL 1330-AM in January, Buckmaster announced he’s uprooting his show and headed over to KVOI 1030-AM, where his program will be simulcast to KAPR 930-AM in Douglas and KJAA 1240-AM in Globe. The latest announcement comes after Buckmaster spent 23 years hosting “Arizona Illustrated” on KUAT. When I spoke to Scott on the phone, he indeed seemed to understand the reason for Buckmaster’s departure and harbors no ill will toward him. Dawn Avalon, vice president of KJLL owner Hudson Communications, did not return repeated calls. Buckmaster will stay on KJLL in the 9 to 10 a.m. slot through the end of the month, then go off the air in May to retool the show before re-emerging on KVOI June 1. The show will air weekdays from noon to 1 p.m.
Bill Buckmaster, who left his anchor gig with Arizona Illustrated last year after more than two decades to launch his own radio show, is again on the move. The Buckmaster Show, which airs from 9 to 10 a.m. on KJLL AM 1330, will be heard from noon to 1 p.m. on KVOI AM 1030 beginning in June. He’ll also syndicate the show on KAPR in Douglas and KJAA in Globe. Buckmaster will remain on KJLL through the end of April and will take May off to retool the show. The format will mostly remain the same, with your Skinny scribe continuing to join a roundtable of local journalists on Fridays. Buckmaster thanked KJLL general manager, talk-show host and friend of The Skinny John C. Scott for helping him launch the show. Talk radio is about to get a whole lot smarter, but it took a local TV icon to get us there. Bill Buckmaster recently ended a 23-year run as host of “Arizona Illustrated” on KUAT’s Channel 6. Now the guy who was a fixture on your TV screen is headed back to his roots in radio. You can listen online at www.buckmastershow.com, where you’ll find archived recordings of past shows, a list of upcoming guests and information about what’s going on in the area. Buckmaster is all about asking the right questions of the right people to get the answers we need to make informed decisions. If you tune in expecting to hear the kind of preaching-to-the-choir rhetoric you get on nearly every talk-radio show in town, forget it. Buckmaster is single-handedly upping the IQ of Tucson talk radio, and we’ve needed it for a long time. He’s been busy lining up guests, but I managed to corral him for a bit. Q: You’re headed back to your roots. Has much changed in radio since you last were on the air regularly? A: Of course, since I left all-news radio in 1980 in San Jose, the technology has improved dramatically, but as for content, radio remains a very personal way of communicating. In TV, folks would say, “I love the tie you were wearing last night,” and say nothing about the content of the interview I was conducting. 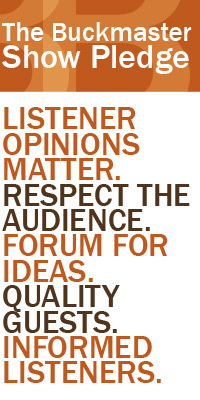 Q: Talk radio is heavily partisan and not always accurate. In fact, mostly not accurate. Can we expect better from you? A: There is no question the journey I am beginning is an experiment in what I call “intelligent talk.” “The Buckmaster Show” is not about what Bill Buckmaster thinks. Instead, it is about presenting a host of top-quality guests and newsmakers and letting my listeners make the decision on the important issues of the day. We will see if there is a place for this type of civil discourse. Q: You’ll have a lot of the same voices on the air that you had in studio at KUAT. How will the radio format be different from what we saw on TV? A: In many ways, the studio segments on “Arizona Illustrated” were radio on television. Other than checking out how the interviewee looked, it was about what they had to say and that sounds like radio to me folks. So I have put together a long list of contributors who were regulars on “Arizona Illustrated” who will join me at least once a month on the radio. Q: Any new voices we’ll be hearing? How’d you decide on the lineup? A: I decided to expand the list of contributors because I want a very well-rounded show that covers a lot of bases in Southern Arizona. We have added Keith Rosenblum, former Arizona Republic and Arizona Daily Star reporter, who will be our border contributor. Jack Challem, who is known as the “Nutrition Reporter.” Other new voices include UA Education Professor Dr. Robert Hendricks on education, historian Ken Scoville, will bring an understanding of why Tucson is the city it is today, and Dr. Mark Sublette will be doing arts and culture segments. Q: Green Valley and Sahuarita are important for many reasons. What do you want to hear from this area? A: Green Valley and Sahuarita are very important not only because of the enormous growth going on there but the environmental impact with the planned Rosemont Mine. 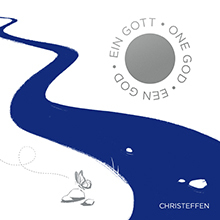 I encourage all my friends who supported me on “Arizona Illustrated” to call the radio show. Buckmaster, an Army veteran, likes to talk about his guests, but let me talk about him for a minute, because he recently collected a couple of notable and well-deserved honors. He won the 2011 Golden Mic Award from the American Advertising Federation, Tucson Chapter, and the Citizen Medal from the Pima County Sheriff’s Department. He didn’t win the awards because he’s a nice guy or because it was his turn. He won them because he’s fair, he’s accurate, and he understands that journalism done the right way contributes to building a strong community. Our best wishes to Buckmaster, because when his new show succeeds we’re all going to be that much better off. On December 16, 2010, Pima County Sheriff Clarence W. Dupnik, presented Mr. Bill Buckmaster with the Sheriff’s Department’s Citizen Medal. The presentation was done as a result of Mr. Buckmaster’s outstanding achievements as Managing Editor and Anchor for KUAT TV’s nightly news program, Arizona Illustrated. Mr. Buckmaster served as the Managing Editor and Anchor for more than 22 years and will be leaving the program after tomorrow’s edition. The Sheriff’s Department congratulates Mr. Buckmaster for his outstanding contribution to journalism, informing the public on a vast variety of subjects, and his direct support of public safety in Tucson and Pima County for the past two decades. The Pima County Sheriff’s Department wishes Mr. Buckmaster the best of luck in all his future endeavors. American Advertising Federation Tucson (AAF Tucson) has announced the selection of Bill Buckmaster as recipient of its 2011 Golden Mic Award. For the past 23 years, Buckmaster has been managing editor and anchor for “Arizona Illustrated” on KUAT-TV PBS 6. On January 3, he launches his new broadcast venture “Buckmaster”, a live, daily radio talk show at 9am on KJLL Radio. The award will be officially presented at AAF Tucson’s 30th Annual ADDY® Awards gala event on Saturday, February 19, 2011 at The Fox Tucson Theatre. The Golden Mic award was established to recognize local media personalities who have given selflessly of their time to help raise awareness and contributions for area charities. 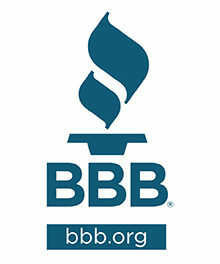 The American Advertising Federation Tucson Board of Directors annually accepts nominations for this award. Previous recipients of the award include Alan Michaels, Bobby Rich, Colleen Bagnall & Patty Weiss, Johnjay VanEs & Rich Berra, Guy Atchley, Brian Jeffries, Chuck George and Ed Alexander. AAF Tucson and Ad2 Tucson are comprised of more than 400 local advertising and media professionals.